Here in Wisconsin, the snow is nearly gone. Only fast-receding remnants of the banks along the driveway and stray patches on the shady, downhill corners of the hayfields are holding out. Every day I trek out to the far field, where we planted 12,000 cloves of garlic last fall. I pull back a little of the straw-mulch, jealous for my first glimpse at the tiny, green sprouts that will rise bravely to greet the warmth of the spring-time sun. It's fascinating to observe how the mulch slows things down. A week ago, while the sun was radiating warmth, the mulch acted as an insulator for the soil below. All around the mulched garlic-field the ground was awash with mud. Yet underneath the mulch, the garlic was still asleep, still locked in the icy embrace of an especially hard winter. Every day I'd check again, and then finally, a few days ago, the sun's persistence proved irresistible. The winter soil had indeed loosened its grip; though icy-cold, the rich, deep-dark loam had softened. Now, ever-so gradually, the garlic will waken this coming week, rousing itself slowly from its wintertime slumber. A brave shoot of garlic greeting the sun's warmth-- last year. We're still a week or more away from the garlic waking up this spring! The trees are awakening, too. Just yesterday I boiled down our second batch of maple syrup. With spring coming so late, it's a tough year for the sap. Nonetheless, yesterday's three quarts brings us up to nine quarts total. The sap trickles slowly, and then some days it suddenly flows. The trees sense that spring is here, and they're eager to waken, to send out their leaves, to soak up the sun's warmth-- to be alive. It's truly a marvel to watch, each March, as winter's hard grip loosens. I loved living, in turn, in Texas and then in North Carolina. But these states don't have the same sharp delineation between the seasons. Only weeks ago, the ground here in Wisconsin was deeply blanketed in snow, and the potential for life was buried, frozen, existing only in hopeful memory and imagination. Today, the robins are hunting worms, the sap is flowing, and the green things of the earth are beginning to grow. Tomorrow will mark exactly nine months to Christmas. It's natural that the Church should mark the Feast of the Annunciation on March 25th. After all, a full-term pregnancy is nine months, and the Annunciation celebrates the appearance of the Archangel Gabriel to Mary and his promise of the Holy Spirit's overshadowing presence. Feast-day celebrations, however, are oddities during Lent, as this preparatory season is one of prayerful sobriety. The Annunciation seemed especially out of place last year, if I am recalling correctly, since March 25th fell on Good Friday. Last year, the liturgical solution was to transfer the Annunciation to a new date after Holy Week. Yet this year, as is the case most years, the joyous celebration of the Annunciation remains, liturgically, an oddly jarring interruption of the ascetical practices of Lent. It occurred to me that there is actually something quite fitting about the Annunciation's placement during Lent. In just weeks, we will be commemorating Christ's passion, death, and resurrection. Yet it all began with the Annunciation. Christ took up residence in the womb of the Blessed Virgin Mary specifically so that he could redeem us through His passion and death on the cross. "... it is in these our Christian mysteries that we can rejoice and mourn for the same reasons." Eliot's Becket is alluding, on a happy Christmas morning, to the mysterious intertwining of life and death. From new life comes death, and from death comes new life. On that Christmas morning, Becket knows that he, too, is soon to die. But he would die a martyr's death, in imitation of the Savior, in full confidence that on the last day he will rise together with all the saints in glory. The first springtime in the Christian story was Christ's rising from death to new life, and many springtimes would follow, Becket's included. Everything about the spring-- and about Lent, which occurs in the spring-- evokes the impending freshness, to steal Hopkins' word, that is buried deep in the dark, loamy dirt, hidden somewhere amidst last year's dead growth. There is dearest freshness in Mary's womb-- and in the deep-down things of the earth, too. Satan's icy grip-- and winter's, too-- are being loosed by the radiance of the risen Son. In the meantime, we await the springtime resurrection with joyful expectation, and contemplate mournfully the passion and death of the Savior. The sweet sap of the maple trees is a foretaste of the sweetness of summer. 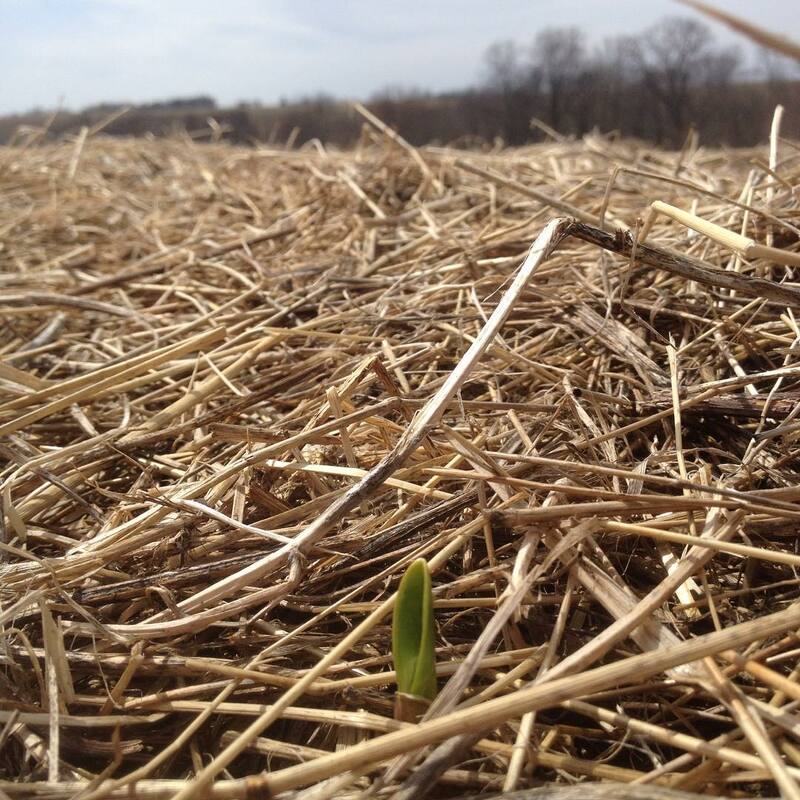 And from under the straw-mulch, the garlic, warmed by the springtime sun, will bravely rise. My grubby, grasping modern mind has trouble hearing "deep down things" and not thinking of *mining* them. I'm a Catholic family man, and these days an occasional teacher and full-time husbandman (tiller of the soil). In "past lives" I worked as a journalist, completed six years of seminary studies and most of the requirements for a PhD in Literature, and taught Latin, literature, history, and philosophy for four years at a prep school. To this day, I have pretensions to being a bibliophile, a scholar, and a writer. When did we become such ignoramuses? Hurray for Dr. Hibbs! Hurray for UD!